Now just a shadow of the two buildings it once was, this has made Burtonwood more manageable and more pleasant, if not a little harder to find. First two hours free for all vehicles, after which cars must pay £15 for a further 24 hours and HGVs, caravans and coaches must pay £25 (or £27 to include a £10 meal voucher). For westbound traffic, the route to get in the services involves effectively u-turning at the complicated J8 roundabout. For local residents, this means accessing the services involves a few hundred yards of motorway only. When exiting, a long road back to the roundabout is used, which at night is extremely popular with rabbits. The then-Prime Minister David Cameron visited Burtonwood in July 2014. The abandoned westbound services before it was demolished. The services originally consisted of two small, octagonal, pagoda-style buildings which were visible from the motorway. The design was supposed to make the most of the simple landscape at this large and exposed location, allowing the buildings to be clearly visible from the road. 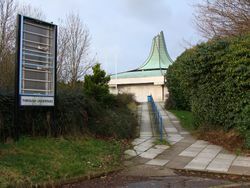 The roof would have been red, as an early way to advertise the services' branding, but planning permission was refused and instead it was copper, soon colouring to its distinctive green. Forte should not have been allowed the contract to build Burtonwood as they already owned Charnock Richard. However, due to the low traffic levels forecast, an exception was made to this rule. When it first opened, the westbound side would close during winter, with pedestrians being sent through a subway under the road. In 1977, Egon Ronay called it "pleasantly decorated", "comfortable" and "clean". The motel was built in 1987. In each building was The Granary and The Shop. Burtonwood had slowly become a very neglected service area. From day one its trade was described as "disappointing". It suffered a decline in quality like any service station, but the disappointing custom meant improvements didn't follow. It was further hurt when a new motorway exit was built right next to it to serve the upcoming Omega development and Gemini Retail Park. In 2008 the westbound services were boarded up and abandoned. Westbound traffic can access the eastbound services via the J8 roundabout (entrance) and the old emergency access road (exit back to J8). This set up was first suggested by Welcome Break in 2000 when the Highways Agency built the new J8, but it didn't happen until eight years later. Halving the site meant that some of the facilities had to be lost, including (unusually for a Welcome Break at the time), the lack of a Burger King and a Coffee Primo. The old westbound side was demolished in 2009 by Marshall and proposed for development including Travelodge, Starbucks and a Harvester pub/restaurant, but the majority of it is set to become offices. Clues as to the original use can still be seen in the original road layout, albeit with the original motorway connection cut off. After the eastbound services became the only surviving side, it was thoroughly refurbished and its condition has been considerably better ever since. It doubles-up as a coach interchange too. 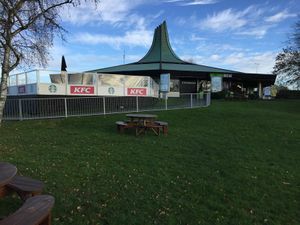 The Starbucks and KFC operate from the centre of the round building, with seating all around the side and toilets and WHSmith at the back.